As a socialising and entertaining space, a sitting room plays an important role. It could be a small space off the side of the dining room, an annex to the living area or even its very own dedicated zone. Wherever it is, a sitting room can be renovated without too much expense to deliver maximum impact. Sitting rooms are sometimes called front rooms, as this room tends to positioned just inside the front door. It is somewhat similar in function to the living room and can be regarded as an extension of that space. Consequently, many of the design principles that apply to the living room can be applied to a sitting room as well. The purpose of the room is important in determining how to dress it up. If you intend to focus more heavily on the entertainment aspect, the aesthetic should facilitate socialisation and mingling, with adequate seating and ambient lighting. If your goal is relaxation, you’ll want enough lighting to facilitate some reading on a cushy couch and storage for books and other hobby materials. You can opt for a formal look with stone, carpeting and furniture in neutral shades. A minimalist take feels trendy and modern, while a rustic theme is a recipe for cosiness. People expect to entertain in this part of the home – if not guests, then at least themselves – so beautiful, durable flooring is critical. Hardwood flooring is always a classic option for instant elegance, especially when paired with the right furniture, and it fulfils the need for durable flooring. Carpeting can also be a great choice, especially in the winter, as it evokes warmth and cosiness; just ensure you go for the highest quality you can afford, because thin carpets can wear out very quickly under foot traffic. Laminate flooring is affordable and can replicate the look of hardwood without the hefty price tag or the need for maintenance. Wide and long planks are the talk of the town. Grey tones and low-sheen finishes were in high demand in 2017, and the interest doesn’t look to be dying down. The right wall paint or wallpaper has an impact on the atmosphere of a room, so first determine the kind of mood you want to set. Dark-coloured walls can make a sitting room feel more intimate, whereas light walls make the space look bigger and airier. A trick to further widen a room is to have the wall trim and mouldings be in a lighter shade than the walls, as it creates a great contrast. You can choose to go bold with striking colours in shades of red, apricot and orange, or go more neutral with an off-white. Shades of blue are a perfect compromise. Wallpaper is an easy way to be stylish without committing long term; it also allows you to explore different patterns that are not possible with paint. Just be careful when removing wallpaper, as it can get messy if not done correctly. Natural light helps to make a space feel bigger, so large windows can be a great design element, especially if your property offers an amazing view. Getting to see a beautiful sunrise or sunset from the comfort of a sitting room is an instant mood booster, as well as a conversation point when entertaining. Top-quality windows can be pricey, but you can sometimes negotiate for a discount if you get all your windows from a single supplier. Make sure your windows are sturdy and properly sealed to protect against the elements to keep heating costs down in cold weather. Window installation can be costly, so look into ways to minimise costs if you feel you can manage doing it yourself. You can find instructional videos online that provide tips and step-by-step guides on the installation process. You’ve sorted the actual windows – now what about the coverings? Gorgeous windows allow you to see out, but you don’t want suspicious characters to have a chance to look in. Thus, you need to choose window coverings, whether curtains or blinds, to frame the space. The overall design of the room needs to be taken into consideration when picking out the right covering. Single-panel curtains are ideal for small spaces, while valence sets look vintage and romantic. Silk and linen curtains allow natural light to shine through because of the sheer fabric. You can choose to layer curtains to create a whole new look, as well as provide additional coverage. A typical trick is to layer heavier printed fabrics over sheer white curtains. Keep an eye on length, too – ideally, curtains should just skim the floor. For those who really love letting the natural light shine in – or want to offer a view of the moon from the sitting room at night – a skylight is another unique way to brighten a space while adding to the décor. You can position the skylight right in the middle of the space for maximum lighting or at the end of the room to light up a bar or couch. A skylight will need to be cleaned at least once a year. Cloudy days are the best time – on a sunny day, sunlight can actually end up leaving water streaks on the glass. A skylight can easily be stained by dirt and scratched by sharp objects, so keep jewellery away when cleaning. Fresh water is enough to spruce up a skylight – at maximum, use an ordinary cleaner without abrasive components. A sitting room can help the set the general atmosphere of the home, so the right lighting is vital. Soft lights are perfect for entertaining and relaxing – you can combine different types of lights to achieve the ideal mood. Dimmers are excellent because they allow the temperature of the lights to be adjusted according to the activity. Ambient lighting casts a warm glow in the evenings, and accent lights draw attention to any specific design elements you want to highlight. Pendant lights and table lamps are a good way to brighten the room and add personality. The use of LED bulbs helps to save on electricity while achieving the desired brightness. They are more long-wearing than traditional incandescent lights and provide better-quality lighting. They are also cooler and therefore less likely to cause injury. Serving essentially as an extension of the living room, a sitting room can be hard to differentiate aesthetically. This is where a striking piece of décor can pop. Built-in cabinets or a beautiful fireplace can be the central element of the room, as long as you build around it. Fireplaces can either convey a homey, old-fashioned feel or a more intimidating, high-class atmosphere, but they always bring warmth. They can also be fitted right into a feature wall as an accent. Built-in cabinets can be both decorative and functional – you can have a open shelves or a set of closed cabinets with unique doors. The key to highlighting a design element is the right placement. Putting it in the middle of the room and placing the right complements in the vicinity, such as books and interesting tidbits on the shelves of a cabinet, will draw attention. Good furniture is a must for the sitting room of your dreams – it is called a sitting room, after all. A nice, comfortable sofa will allow the space to be fully enjoyed on a lazy day with a good book and a cuppa. Leather chairs are perfect to curl up in, while chaise lounges are ideal for guests. You can prop accessories like pictures and flowers on end tables to add a personal feel, colour and life to the room. Incorporating a feature wall is another easy way to decorate. You can put up interesting patterned wallpaper or create a tone-on-tone pattern through moulding, which showcases textures. Pay attention to the material your chosen sofa is made of – for durability, go for stain-resistant fabric and cushions made of wrapped foam. Leather is a longwearing material, although it can get warm in the summer. For Silk Home CEO Naomi Findlay, every renovation project begins by peeling back the layers on the property. Paint jobs also hid some nasty surprises, like animal contamination inside the walls and rotten window frames – making Findlay’s commitment to doing thorough checks invaluable to her work on this property. “If I hadn’t carried out an inspection to find the downpipes and asbestos, then there’s no way I could have made this type of profit,” she says. However, dealing with these issues also helped Findlay to see an opportunity to maximise the existing space for effective use. 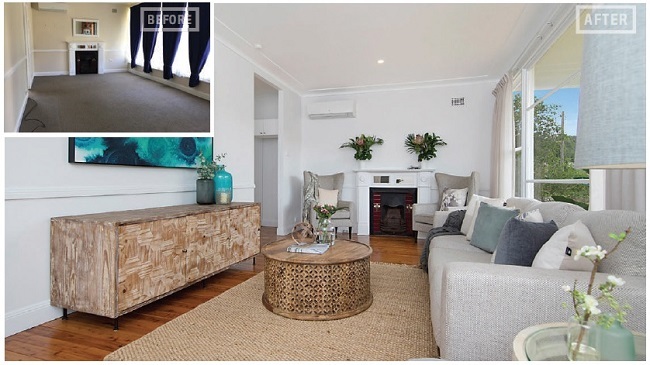 The new space flows perfectly to the living room, and this transformation ended up being the biggest game-changer in the project, adding a lot of value to the property.